I really do hate that term; Taming. It may be me and my own perception of that word when it comes to any wild animal in captivity. Taming to me it means breaking the spirit of the wild animal and stripping away all the instincts that Mother Nature has instilled in a species to allow it to survive in an unforgiving world. I much prefer for my captives to retain who and what they are as they were designed. I prefer the term “calming”. My approach is more along the lines of understanding why they feel insecure and the need to respond to us in a negative fashion. Then take those items away from the animal and gain the trust that you mean them no harm. I have worked with many animals in my life time that seemed at first in my care to only want to inflict some sort of pain on me… from squirrel and capuchin monkeys, parrots, big cats to more reptiles then I can remember. When it comes to Blood and Short tailed pythons nothing works as well as sweet time. But most new keepers to these species need that instant gratification it seems. They feel forcing long handling sessions, using gloves to restrain and forcing the animal to be held and brought into life’s daily routines will get them used to it all quickly and “Tame” them in no time. This type of approach will just prolong the process of having a positive good relationship with these species. Their will is strong and they are not a species that can have their spirit “broken” easily. Gaining their trust is a much better way to go. Below is how I worked with all the babies I hatched over the years and older unruly animals that were acquired during my time working with the species. So this is how I dealt with the rouge animals that some will call “Aggressive”. As I said these guys are very individual in personality. There are animals that are downright shy, inbetweeners and the high strung insecure animals that can be calmed over time.When it comes to animals less than 6 months old I preferred to just let them be blood pythons. 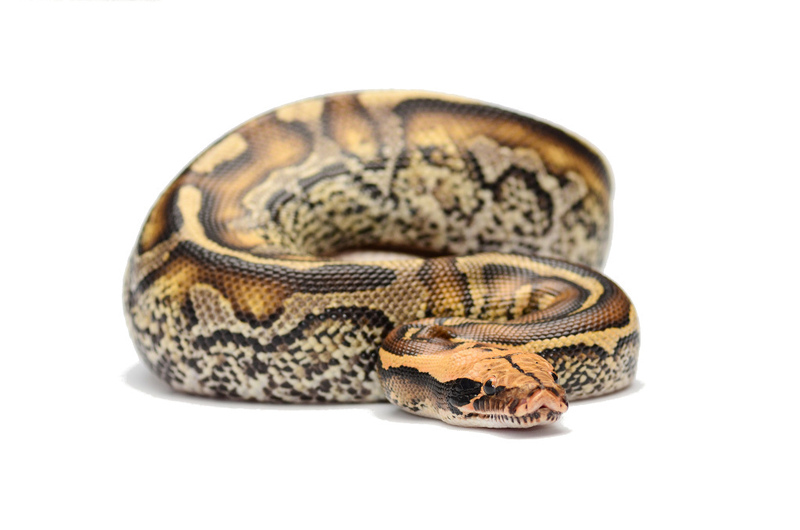 You are going to have up to a 20 year relationship with this animal so there is no need to not let them just be blood pythons during this time. They need to learn how to “Hunt”, how to thermoregulate, how to find water in their caging and feel secure in their hide spot. All the life skills to survive in our care. During this time I limited their exposure to me by simply lifting them out of their tub for cleaning with a hook and place them directly on my flat hand palm up. Then after a few seconds place them in the new clean tub. A simple interaction to feel being lifted from their cage by a minimal intrusive instrument verses a giant warm hand that simulates a giant predator that Mother Nature has instilled in them to fight back against if they want to survive. That is all the interaction I would have for the first 6 months in general. All Bloods and Short tails have their own personalities but there is a generalization to their character that has to be understood before you take the next step. So Bloods and Short tails are unlike other python species as they are the poker faced defender. What I mean by that is they do not give you signs generally that a strike is about to be delivered. They prefer to remain motionless tracking you with their eyes only and when the opportunity arises to strike and they do so in an explosive fashion. 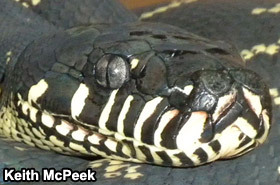 This leads many new keepers to think that they are nasty animals much more aggressive than other python species. The fact is they are not. It is just that you were lacking in reading your animals mood. When a carpet python is coiled in an S fashion and tracking your every move you know its intentions and deal with it accordingly. It is more typical of what most keepers are used to. But the frozen blood or short tail you are reaching in to grab may lull you into a false sense of security so the strike surprises you and you deem them nasty because of this. A moving blood python that is simply crawling with tongue flicking is a calm confident blood python. A frozen rock solid blood with tongue sticking half way out is an uneasy blood trying to figure out fight or flight. My thought on Bloods and Shorts was not of them being aggressive animals but more of an insecure animal. Using that approach when interacting with them allowed me to gain their trust quickly (relatively speaking). Warning signs your Blood or Short is in a ‘don’t mess with me mood”, as talked about above is that rock solid frozen stance. Tongue half out and tail wagging is a sign of extreme excitement and/or fear and the feeling they need to defend themselves. The wiggling eye (once seen you will understand that), it is actually comical once witnessed but this can be the first sign of excitement building in the animal. So how do we deal with calming the animal. Keep interactions positive plain and simple. Blood and Short tailed pythons do not respond well at all to being restrained. This is the greatest insult to them and they will not allow it. If you attempt to grab them behind the head (adult or subadult) and restrain like you would typically do to any other aggressive python they will crocodile roll and seem to be willing to twist their own head off. Large wide snake hooks are best used on these animals in full on defend mode. The goal is to lift the animal and get them where you want them to go quickly or if you must handle them for cleaning or other maintenance. Routinely doing this with a larger animal that has not yet been calmed in captivity until they get used to this interaction and you will soon be rewarded in being able to use a free hand to support the animals back half. This will lead to the next step, lifting the animal with a hook, getting a hand on them and putting the hook down so both hands can support the animal. Don’t give them a target and move deliberately. Keep interactions brief. Gaining trust is the key. Over time this will lead to freely handling the individual. If an animal is extremely high strung I will do as above but start off using a gloved hand. Not to protect from a bite but more to allow the animal to get used to your moving hand on their body without the added stimulus of warmth. In nature if something is warm and moving touches you it usually means predator. Take that out of the equation at first by using a thin glove. Also remember that most attacks on snakes from a predator occur from above due to the design of these animals. When approaching a Blood or Short tail on high alert a side approach is always best. Try not to cast shadows over the snakes head to elevate the situation. It is your job as a keeper to calm all situations down not elevate them to the next level. My hopes are to instill you with some confidence if you are new to the snake keeping game and are contemplating taking the next step as a keeper to work with one of the more intermediate species. Bloods and Short tailed Pythons are very rewarding species to work with. Most captive bred animals will already have been exposed to proper interactions by responsible breeders and most of the calming process has been started for you to continue. Bloods and Short tailed Pythons have a lot to offer those of you wanting a lot of snake in a smaller package lengthwise. Don’t be intimidated by their reputation perpetuated by those who have not worked with them. Start off with younger animals and gain an understanding of their personalities. Approach them as stated above and with that mindset I promise you will not be disappointed.